It used to be that after-hours care was only available in a hospital’s busy emergency room–even if your condition wasn’t life-threatening. Today, you have another option: FastMed Urgent Care. FastMed makes it easy for you to be treated for non-life-threatening illnesses and injuries outside of the normal 9-to-5 schedule. FastMed is fast, convenient, and affordable. With over 85 locations in North Carolina and Arizona, finding an after-hours clinic in your neighborhood is easy! 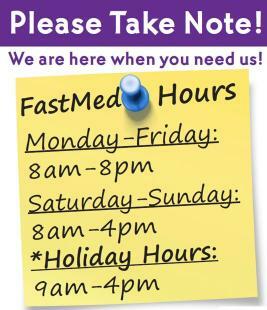 FastMed’s medical professionals are here 365 days a year to provide you with high-quality care and compassion. Our after-hours clinics are equipped with on-site labs and x-rays, so you don’t have to wait too long for your results. We strive to get you in and out within an hour, so you can get home to recover as quickly as possible.